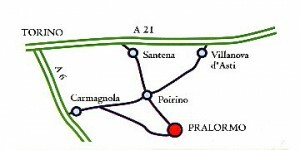 A21 TURIN-PIACENZA, exit SANTENA, then follow directions for ALBA-POIRINO. A21 PIACENZA TURIN, exit VILLANOVA D’ASTI, then follow directions for ALBA-POIRINO. A6 TURIN-SAVONA, exit CARMAGNOLA then follow direction to PRALORMO. A7 MILAN –GENOA, stay on A6 PIACENZA –TURIN exit VILLANOVA D’ASTI then follow direction to ALBA –POIRINO. Freeway MILAN-TURIN , Tangenziale of TURIN follow direction to freeway A6 TURIN-SAVONA exit CARMAGNOLA then follow direction for PRALORMO. Airport of Torino Caselle .